In July of 2016, you stood with us when IJM investigator and human rights lawyer, Willie Kimani, and two friends, Joseph Muiruri and Josephat Mwenda, were abducted and murdered. You helped spark a global outcry for #JusticeinKenya and an end of police abuse of power through this ongoing petition. Five alleged perpetrators are in custody. The second phase of the trial began on February 13, 2017. We invite you to join us in keeping IJM’s Kenya team, and the families of those who were murdered, lifted up in prayer. We'll share news and prayer updates right here to keep you informed over the course of the trial. Previously, the trial for the murder of Willie, Joseph and Josephat was set to continue the first week of December. Unfortunately, the lawyer for one of the accused failed to appear, and was too ill for the case to proceed. The judge adjourned and gave dates in March for the trial to continue. In February, the dates were changed from March to April 11-26, but allotting a longer block of sequential dates for the trial. Unfortunately, one of the other lawyers for the accused has been ill, and so the judge has granted an adjournment of the trial once again. The dates that were set for next week (April 23-26) are no longer available because the annual High Court Judges Conference has been scheduled for that week. The next dates that the judge has available are in October. The case has been adjourned to October 1, 2018, when we will hear testimony from the remaining 8 prosecution witnesses. Thank you for continuing to pray for this case! Please especially be praying for the witnesses who are still remaining to testify, and for the families of the deceased as they have to continue to wait for justice. Also, pray that the prosecution will be able to close its case during the 10 days of trial scheduled in October. The trial continued on November 29, 2017 after a one month break. The defense lawyers finished cross examining the inspector from the Directorate of Criminal Investigation (DCI), who had earlier given testimony on technical aspects of the case connecting the accused to the scene of the murder. After the cross examination, the prosecutor asked for an adjournment and the case was adjourned. The case will come up for further hearing on December 5, when an additional police officer will give his testimony. There are 8 additional witnesses remaining. Following their testimony, the prosecution will close its case and Judge Lessit will make a determination on whether the accused have a case to answer. What Media Has Followed the Case This Week? Continue to pray for the emotional healing of the families of Willie, Joseph, and Josephat. Continue to pray that justice will be served in this case. Praise God for the number of witnesses that have testified so far. The inspector from the Directorate of Criminal Investigation (DCI) completed his testimony on technical aspects of the case connecting the accused to the scene of the murder. The defense lawyers asked for more time to enable them get a technical expert to assist in explaining the technical language of the witness before they could cross examine him. The judge granted the application and gave additional hearing dates. The next hearing date is set for November 28, 2017 in which the defense lawyers will cross examine the police inspector from DCI. Six additional hearing dates are set between November 29-December 11. This is a critical stage of the trial, so let’s continue praying for courage and safety for the remaining witnesses. Pray for the emotional healing of the family members. Thank God for the number of witnesses who have testified so far, and for the relatively fast progress of the case compared to other police abuse trials. The trial for the murder of Willie, Joseph and Josephat was scheduled to continue on Monday, October 16. However, the case did not proceed, as one of the defense counsel was not present. Justice Lessit strongly reprimanded the absent defense counsel and adjourned the case until Wednesday, October 18. Unfortunately, the trial did not go forward on October 18 either, as one of the accused reported to be ill and seeking medical attention. The trial was subsequently adjourned. The court gave out additional hearing dates, which are October 16 through October 31, 2017. We hope and pray that during those hearing dates the prosecution will be able to complete the testimony of their final 10 witnesses. So far 34 witnesses have testified. Thank God for additional trial dates. Thank God for the 34 witnesses who have testified so far. Pray for family members of the deceased as they continue on the healing journey. The trial for the murder of Willie, Joseph, and Josephat was scheduled to continue July 31, 2017. Unfortunately, the trial did not proceed. One of the defense attorneys was absent for a personal issue, and the court granted an adjournment. The trial for the murder of Willie, Joseph, and Josephat continued the week of July 17-21, 2017, with Justice Jessie Lessit of Milimani High Court presiding. All five accused remain in custody. This week five witnesses testified: a police officer, a government doctor, a government chemist, and a court official and a county communications officer. The testimony of the first three witnesses touched on physical evidence recovered at various scenes of crime. The fourth witness presented court proceedings from the trial case that Willie, Joseph and Josephat had been attending on the day of their abduction. The final witness, a government communications officer, provided information on communication devices that were issued to the police unit of two of the accused. During the course of the week, the trial was interrupted on Thursday, July 20; it was adjourned as the defense had not reviewed the evidence to be presented that day. The trial resumed on Friday, July 21, with the testimony of the fifth witness of the week. Numerous Kenyan media outlets have been covering the trial. The trial will break for the week of July 24-28, resuming on July 31 to hear more witnesses. Following this, the court will set the schedule for the next set of dates when the hearings will take place. Please continue to pray for the families of Willie, Joseph, and Josephat, particularly for their emotional healing as details of the murders are shared in court. Pray for continued security around the case, especially as witnesses are continuing to share critical evidence. The trial for the murder of Willie, Joseph, and Josephat continued on Thursday, July 13, with Justice Jessie Lessit of Milimani High Court presiding. All five accused remain in custody. On Thursday, the defense attempted to delay the trial by requesting that the trial be adjourned while they seek to appeal Justice Lessit’s decision to allow the victim’s lawyer to cross-examine witnesses. Justice Lessit denied the defense’s request and the trial proceeded as scheduled. A police officer witness testified on Thursday, and on Friday two additional police officers testified regarding the details of the various crime scenes involved in the case. The trial will continue with hearing dates schedule through July 31st. Up until this point, the trial has focused on proving motive and premeditation. However, Thursday began a critical stage of the trial where the focus will shift to specifically implicating the five accused in all three murders. We will continue to update this LIVE blog report as the trial continues. Please pray for peace of mind and calm for all the witnesses. Pray for protection for all persons involved in the case. The trial for the murder of Willie, Joseph, and Josephat continued the last week of May, with Justice Jessie Lessit of Milimani High Court presiding. All five accused remain in custody. Previously, the defense made an application to prevent the victims’ lawyer from cross-examining witnesses. Justice Lesit dismissed the defense’s application and ruled that the victim lawyer can ask questions on matters on record. This ruling sets a clarifying precedent for victim lawyers to ask questions in a trial. Although the procedure to have the victim lawyer ask questions is in the law, the law lacked clarity on when and how this should be done. This ruling provides the needed clarity. The judge has set the next hearing dates for the case for the second half of July. Praise God for the ruling by the judge to allow the victim lawyer to cross examine witnesses. This is a big win, not only to this case, but to other future cases. Praise God that the court has set aside 10 days in a row to hear this case; this is unique and we count it God’s favor. Continue praying that this case will cause a tipping point to end police impunity in Kenya. The trial for the murder of Willie, Joseph, and Josephat continued this week, Justice Jessie Lessit of Milimani High Court presiding. All five accused remain in custody. Four witnesses testified this week. On Monday, a police sergeant and a civilian testified on aspects of the early investigation. On Tuesday, a woman testified to identify of Joseph Muiruri’s car that was dumped outside her house after the abduction. Next, a police officer testified about the undercover police unit to which the five accused belonged, and confirmed that when he dropped two of the accused off at the police station on June 22, one of the accused had his police radio with him. The defense counsels challenged the order in which the prosecution and defense have been examining witnesses. Currently the lawyer representing the victims and their families has been the last to ask questions, as was agreed in pre-trial. The judge directed the defense to make a formal written application to challenge the order of witness examination, and the trial is adjourned until April 24, 2017, when both parties will appear to make oral arguments. This means that eight days of hearings which were scheduled over the next two weeks will have to be rescheduled. The judge will likely rule on the application from the defense on April 2 or 26, as well as set the next hearing dates. Thank God for the continued cooperation between IJM lawyers and the prosecutor. Pray that the trial will be rescheduled to consecutive dates in May and June, and that there are no further delays to hearings. The trial proceeded this Monday (March 27) with Justice Lessit presiding. Four witnesses testified, bringing the total number of witnesses who have testified to 22. Dr. Johansen Oduor, the government pathologist, testified on the cause of death for the three victims. He identified injuries indicating that the victims had resisted a violent attack, forming the conclusion that Willie and Josephat’s deaths were caused by blunt force trauma. As for Joseph, the pathologist concluded that he died from strangulation and head injury from blunt force trauma. Three police witnesses testified on various aspects of the case. The first, a chief inspector, confirmed that a specific police radio was issued to one of the accused. The second witness was a constable at the camp where Willie, Joseph and Josephat were held in a container cell. The constable confirmed receiving keys to the cell from one of the accused on the night of June 23rd. The corporal testified that the accused told him there were no detainees in the cell and that it remained locked after that handover. The third witness, a corporal, was at the Mavoko Law court where Willie, Joseph and Josephat were kidnapped, on June 23rd. He testified to allowing an associate of one of the accused to use his phone to make a call. The trial was adjourned on March 30, and will continue on April 3, when the prosecution will continue to call witnesses to testify. Pray for the family members of the deceased, for healing as they continue hearing heartbreaking details of the deaths of their loved ones. Pray as the trial continues for truthful testimonies from witnesses, and for the trial to continue moving forward without delays. The trial proceeded on Wednesday this week, with Justice Lessit presiding. Four witnesses testified, bringing the total number of witnesses who have testified to 18. Emotional testimony was shared by the three family members who identified the bodies of Willie, Joseph and Josephat. A police officer then testified that one of the accused took over after his shift on June 23, 2016, confirming that the accused was on duty at the Syokimau Camp at the time of the murders. When the trial commenced on Thursday, one of the accused informed the court he was ill and unable to continue. The judge adjourned until 27 March, but warned the defendant against feigning sickness. Last week, the defense requested permission to recall seven witness that had already testified. Justice Lessit ruled that only 2 witnesses could be recalled, as long as the prosecution agreed. This week, the defense withdrew their request, stating they would not recall any of the previous witnesses. The trial will run for four days next week, beginning on Monday, March 27. Pray for the families of the deceased and the entire IJM Kenya team as they hear very difficult and emotional evidence shared in court. Pray for the trial to continue to run smoothly, and that there would be no unnecessary delays. The trial for the murder of Willie, Joseph and Josephat resumed in February, with Justice Lesit presiding. So far, 14 witnesses have testified for the prosecution. This included testimony from a forensic document examiner, who confirmed that a note written to Josephat’s wife requesting help was in Willie's handwriting. Several witnesses provided testimony that they had seen men matching the description of three of the accused at the crime scene. The defense requested seven witnesses to be recalled for further cross-examination. The prosecution objected, arguing that it would be an unnecessary delay to the case, and not provide any additional useful information. The judge ruled it unnecessary to recall all seven witnesses. The judge did grant that the two civilian witnesses who received the note from Willie could be recalled at the discretion of the prosecution. Kenyan media has continued to cover the trial. The prosecution have reduced the number of witnesses they plan to call from 60 to 36, meaning that 22 more witnesses have yet to testify. The trial is set to continue on March 22 and 23, with testimony from family members. Then, we expect evidence from the pathologist and radiologist. The trial is expected to proceed through April. Praise God that the case has proceeded without major hitches to date and that the witnesses have provided strong testimony. Pray for peace and calmness for IJM staff and the families of the victims in the coming week as evidence from the crime scene will be shared which is likely to be traumatic. Pray that the media will continue covering this story and keep the public interest. We are praying that this case will be a turning point to police impunity in Kenya. There's a new blog from IJM's Director of System Reform in Kenya, Wamaitha Kimani. In "Stand Up! For Willie, Joseph and Josephat—" Wamaitha calls on each of us, and most of all, her fellow Kenyans, to stand with her for justice. Read the new blog here. 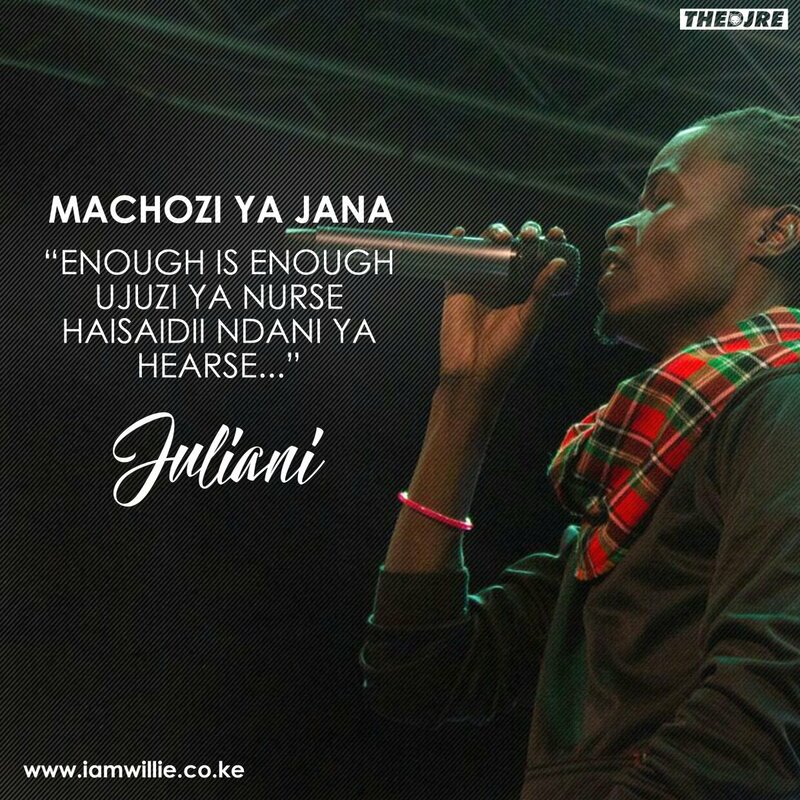 Additionally, IJM has partnered with Kenyan hiphop artist, Juliani, to create the sound of the movement: Machozi Ya Jana. Stay with us for more updates as the trial resumes this month. The day began with the defence counsel's cross-examination of the first witness, whose testimony sought to establish the circumstances leading up to the deaths of Willie, Josephat and Joseph. When this was concluded, the prosecution called their second witness to the stand. For both witnesses, the court operated with caution to ensure safety. Photographs and video of the first witness were prohibited, and for the second, the media and members of the public were ordered to clear the courtroom because of witness protection. The news of the murders of the three and their bodies being dumped in a river earlier this year sparked an ongoing national outcry that echoed around the world, demanding justice and police reform in Kenya (IamWillie.co.ke). The case has now adjourned, and is expected to resume in January. We'll continue our LIVE blog updates then, and ask for your continued prayers and support for justice in this case and police reform in Kenya. “Sticks in a bundle are unbreakable." An anxious crowd waits patiently outside the Nairobi High Court for commencement of the hearing of the WJJ case. The huge turnout included law students from Kenyan universities, who had come to follow the high-profile case. The courthouse was so packed that some had to be asked to leave. 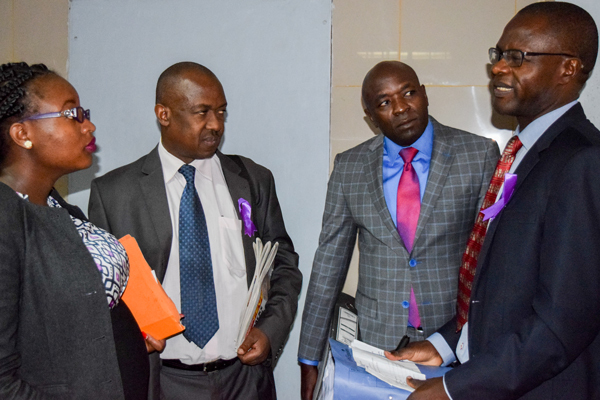 The courthouse was packed, the lawyers sported their purple ribbons and the day began with a general feeling of anxiety over whether or not the trial would yet again be delayed—but at last, Mr. Ombeta, the counsel for the defense, was present. Lawyers in the case of the WJJ case, prior to the hearing’s commencement. Some wear the purple ribbon, to show solidarity with the victims concerned in this case. Mr. Ombeta, counsel for the defense, is second from the right, in the pink tie. 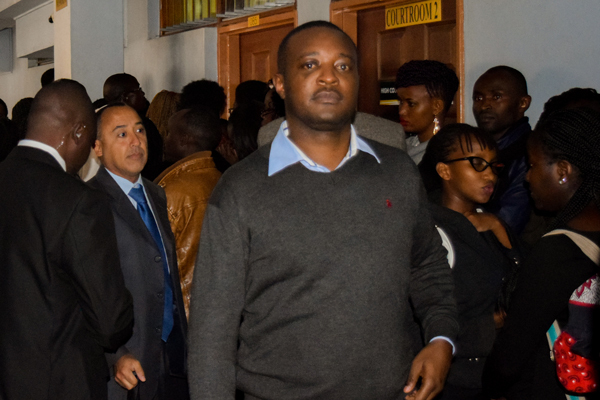 Mr. Ombeta offered his apologies to the court, which the judge accepted, although some lawyers present felt that his three-day absence on account of being ill had caused undue delay. The trial commenced with the testimony of the first witness from IJM, who requested that his identity not be shared. Mr. Mutuku, the prosecutor, led the cross-examination of the IJM witness, and the counsel for the defense will begin cross-examination tomorrow morning. The witness who testified today. God would grant peace and confidence to the witness scheduled to testify tomorrow. There would be continued commitment from the judge, prosecution and stakeholders involved. The scene at Milimani High Court was similar to that of yesterday morning, with the courtroom filled with people and lawyers wearing purple ribbons lining the aisles. As before, the suspects entered at 9:30 AM, looking pensive and whispering animatedly to each other over the course of the morning. And—again—the defense counsel began by putting up a spirited argument for adjournment. "Contrary to our request, I note that the defense counsel has not shared documents to show that he has been hospitalized," said Justice Sitati, accusing the counsel for the defense, Mr. Ombeta, of delaying justice. "I adjourn the hearing to Thursday and trust that the defense counsel, Mr. Ombeta, will attend court then, or send another lawyer. If not, we will appoint a new lawyer for the three suspects that Mr. Ombeta was representing, and take disciplinary action against him." The case came up again today, and that the court established a firm plan for moving forward, notwithstanding the continued absence of the defense counsel. The good support from the community—including the Kenyan legal community—in court today. The court will proceed on Thursday as planned, and that the judge will be firm in not allowing another adjournment. The trial witnesses and families of the victims will have patience and perseverance through this difficult waiting period. "IJM exists to protect the poor from violence, and Willie's life was taken while courageously pursuing that mission." The day was bright and sunny, and by 9:30 AM, the five accused persons had been brought into the courtroom at Milimani High Court. The room was packed to capacity with journalists, lawyers, human rights activists, IJM staff members, relatives of the victims and friends. Several of the lawyers donned purple ribbons to show solidarity and support. All were gathered for the start of the much-anticipated trial on the case of the murders of Willie, Joseph and Josephat (the "WJJ case"), which was slated to begin this morning, but court proceedings began with a request for a delay. A representative of the defense informed the court that their lead lawyer, Cliff Ombeta, had been taken ill and could not attend court. They asked for a three-day adjournment. The judge, Lady Justice Ruth Sitati, marked the casual manner in which this request had been made and directed that the hearing would continue tomorrow, instructing Mr. Ombeta to "send a representative if he is unable to attend court." The case has attracted media and public interest, given how the victims met their deaths. After the case proceeds this week, the trial is scheduled (tentatively) to continue January 9-13, 2017. Thank God that the case came up today and that a well-respected and experienced judge, from outside of Nairobi, has been appointed to lead it. She delt firmly and fairly with the absence of defense counsel. The court will proceed well tomorrow, and for all the legal representatives to be present. The witnesses coming to testify tomorrow will do so well, and that they will not be anxious for their safety. The WJJ case will be a turning point for ending police impunity and extrajudicial killings in Kenya. There will be continued healing and peace of mind for the families of Willie, Joseph and Josephat as they hear the testimonies that will begin to come out tomorrow. Come back here tomorrow for more updates from Nairobi. Find out more about our team in Kenya and their continuing fight against injustice. Watch Joseph's Story, and get a deeper undertanding of the issue of police abuse of power and how IJM is working to end it. As part of their daily rhythms during the trial, our Kenya team will be using specific prayers each morning as they begin the work day, and each evening after they debrief the day's events. Our hope is that these will help the team enter and exit these difficult workdays with a counsious sense of God's presence. As many of you will be praying along with the team, we thought it might be meaningful for you to have the same prayers the Kenya team will be using. Perhaps you might consider using them at the beginning and end of your workday, or with your family at the breakfast and dinner table. Check back here for LIVE updates from Kenya as the case and the campaign for justice moves forward.